The newsly constructed colonial farmhouse at 1115 Banks North Road in the Greenfield Hills neighborhood features 10 rooms and 4,400 square feet of living space. FAIRFIELD — Past and present merge seamlessly and beautifully on a property at 1115 Banks North Road in the Greenfield Hills neighborhood. 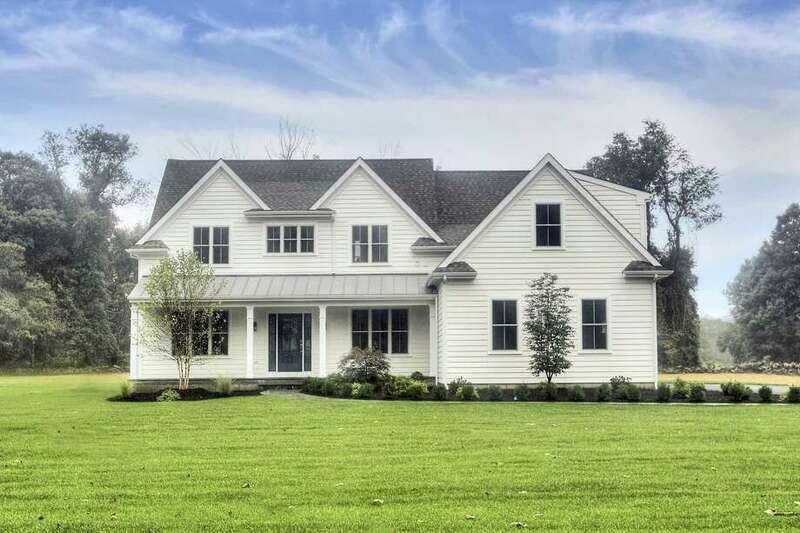 A newly constructed colonial farmhouse with a timeless design celebrates Fairfield’s agrarian roots while offering all the important amenities for modern living. Banks North Road is a scenic road, as designated by the town. Pulitzer Prize-winning poet and novelist Robert Penn Warren knew something of agrarian life. He was born in a midwestern town of fewer than 1,000 people and “Warren’s poetry and fiction sprang from his Southern Agrarian heritage,” according to the website for the Poetry Foundation. For 38 years, Warren, the United States’ first poet laureate, lived in Fairfield in a converted barn at the Jennings Farm on Redding Road. When he wasn’t glued to his typewriter churning out iconic literacy works, like his novel “All the King’s Men,” he was walking the farm fields and meadows of Redding Road and Banks North Road. “You don’t write poems sitting at a typewriter; you write them swimming or climbing a mountain or walking,” Warren once said. He may have walked the 2.19-acre level property at 1115 Banks North, although, were he alive today, he would not recognize the house that occupies that parcel. The 4,400-square-foot house was only recently completed by Pinnacle Peak, Inc., the Shelton-based father and son firm known for custom construction in Fairfield and Litchfield counties. In fact, Pinnacle Peak was behind the construction of the house on the Jennings Farm property, next to Warren’s converted barn. This Banks North house enjoys a sophistication that was lacking in most of the houses that occupied Banks North decades ago, when Warren lived nearby, and it has features that past residents wouldn’t even think to dream of. It has wide-planked character-grade oak flooring on the main living level, custom millwork, and an ideal floor plan for living and entertaining. In addition to the home’s existing amenities there are other features that can be incorporated into this property. Prospective homebuyers can inquire about the construction of a customized auto or party barn augmenting the attached two-car garage, the installation of an in-ground swimming pool, and the building of a tennis or other sport court, all of which have designated sites as mapped out by Pinnacle Peak. A fieldstone wall lines the front and sides of this property, its pillars marking the entrance to the paved driveway. A bluestone path leads to the long, covered front porch with a standing seam metal roof, wide enough to accommodate a rocking chair for relaxation. Inside, the true center hall has a glass-paned door at the rear that allows a view of the backyard from the front entrance. The foyer provides access into the study on one side and the formal living room on the other, both with wide, open entranceways. The formal dining room is accessed from the living room and from the long hallway that goes from the foyer to the back of the house. The spacious gourmet kitchen was thoughtfully designed as the heart of the home, according to the two co-listing agents. It features a huge center island/breakfast bar, quartz counters, a marble backsplash, walk-in pantry, and high-end appliances including a Thermador range. In a nod to the town’s early history this house has a keeping room, which is open to the kitchen and family room, and it has a gas-fueled stacked stone fireplace. The keeping room also provides access to the mudroom, garage, side entrance, and powder room. In the family room there is a fieldstone fireplace flanked by built-in bookshelves, a coffered ceiling, and a wall of nearly floor-to-ceiling windows with a door to the rear paving stone patio and yard. On the second floor there are four bedrooms. French doors open into the spacious and luxurious master suite, which features a Juliet balcony, two walk-in closets, sitting area, and spa-like marble bath. One other bedroom is en suite and the other two share a Jack-and-Jill-style bath. Although this is a private setting in a seemingly remote part of town this property is a surprisingly easy to drive distance from the town center, train station, and beaches. It is only about six minutes away from the Post Road (Route 1). The Patterson Country Club, which offers golf, racquet sports, dining, and social events, is just down the street on nearby Cross Highway. It is also only two minutes to the center of Greenfield Hill, site of the annual Dogwood Festival. There will be an open house on Sunday (Dec. 2) from 1 to 3 p.m.
For more information or to set up an appointment to see the house contact Kaitlyn Walsh or Denise Walsh of Denise Walsh and Partners/William Raveis Real Estate; Kaitlyn at 203-231-1950 or kw@dwpartners@gmail.com, and Denise at 203-650-1583 denise.walsh@raveis.com.